In case you missed it, Better Homes and Gardens hosted their first-ever livestream event last week! Filled with tips and tricks for getting your home guest-ready holidays, it’s definitely worth watching the recorded video if you missed it. I took away tons of ideas for our upcoming celebrations. One of my favorite is this delicious hot chocolate mix… Not only is it a wonderful treat to have on hand when there’s a cold wind whipping around outside, it’s also perfect for gift giving! Whether you’re making this hot chocolate mix recipe to keep on hand or give as a gift, these BHG Flip-Tite Storage Containers are ideal for keeping your mix fresh and easy to access. 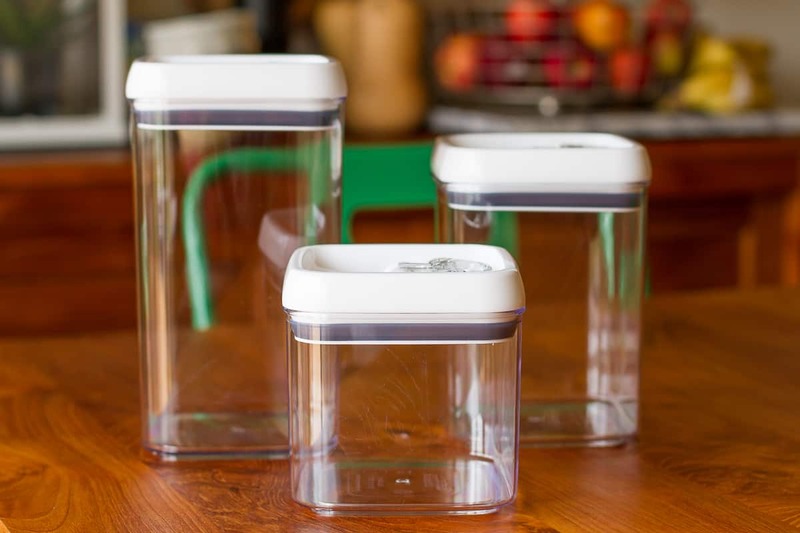 I use the 7.5-cup container for this recipe, but if you need the extra storage, this 3-pack is the best value for your money. You get one each of the 4.5-cup, 7.5-cup and 10-cup containers (a savings of $2.91), PLUS the set comes with a 1-year subscription to Better Homes and Gardens magazine! To be completely honest, if I’m making this hot chocolate mix for personal use, I just dump everything into my container and give it a good shake to mix it all up. But if I’m giving it as a gift, it looks prettiest when you layer the ingredients one by one. Above is a quick video my girls shot that shows how easy it is to make this hot chocolate mix! This is definitely a kid-friendly project. 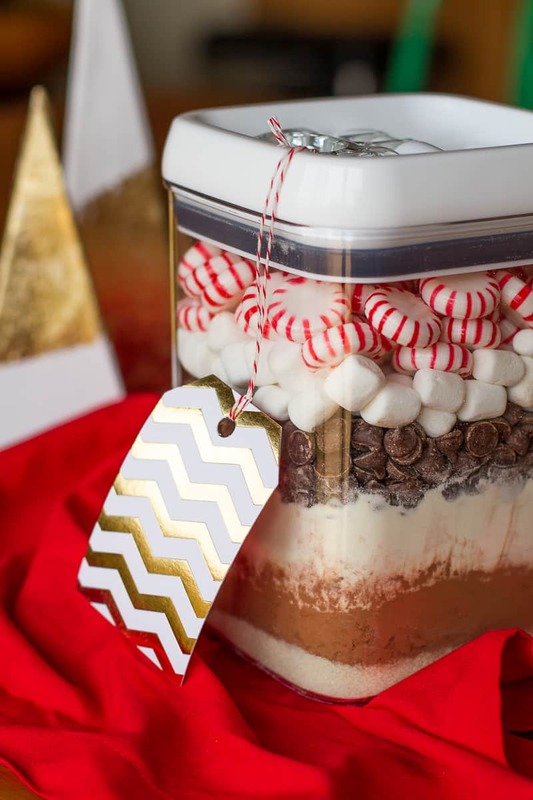 Finally, add a gift tag with instructions on how to prepare the hot chocolate for drinking (it’s a simple 1:1 ratio), and you’ve got a fantastic teacher gift, hostess gift, thank you gift, etc.! I picked up these gorgeous gold and white gift tags in the Walmart craft department. In a 7.5-cup BHG Flip-Tite Storage Container, layer the hot chocolate mix ingredients in the following order: sugar, cocoa powder, milk powder, chocolate chips, marshmallows (optional) and peppermints (optional). Store in a cool, dry spot for up to one month. 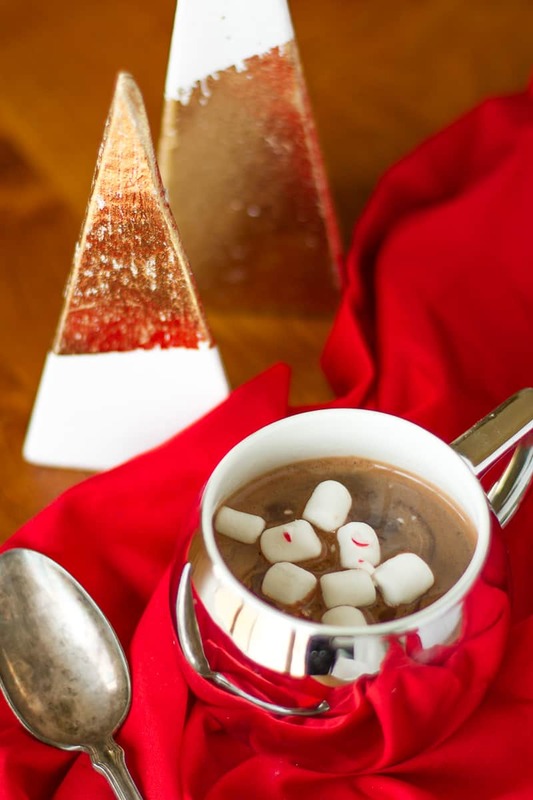 To prepare the hot chocolate mix for drinking, combine 2 cups of mix with 2 cups of water in a large saucepan. Stir over medium heat until the chocolate pieces are melted and the mixture is heated through. Makes 4 servings. I should note that this mix definitely earns the “decadent” label! It produces a hot chocolate that is creamy, thick and rich, and a little goes a long way, so keep the servings small. Mexican hot chocolate mix — add 1 tablespoon of cinnamon and a pinch of chili powder. peppermint hot chocolate mix — add one cup of peppermint candies or crushed candy canes, also a great addition to the white hot chocolate mix below. white hot chocolate mix — substitute 1 (3.4-oz.) package of white chocolate pudding mix for the cocoa powder, plus a few changes to the ratios throughout. What’s your favorite way to serve hot chocolate? This looks awesome, but do you really mix it up with 2 CUPS of mix in 2 cups of water? Seems like a lot! Hi Sue! I had the same reaction when I first read the recipe on BHG, and actually, they call for 1 2/3 cup water to 2 cups of mix, so I already increased the water a bit. It makes a very rich and chocolatey hot chocolate (decadent!!! ), so small servings go a long way. I definitely think you could increase the water even more if you prefer, though. Thanks for update. I’ll have to try it both ways.